“The window of opportunity to complete [the] TPP is closing so you wouldn’t say it’s impossible to complete the deal if it doesn’t take place in Atlanta, but it does become more difficult,” Key told the Asia Society in New York this week. To coincide with Thursday’s action, activists from SumOfUs.org, MoveOn.org, andActionStation ran a full-page ad in the local alt-weekly Creative Loafing slamming the secretive trade deal. said Jon Lloyd, campaign director for SumOfUs. In particular, activists in Atlanta are highlighting how the TPP could slash access to affordable medicines. As the Japan Times reports, drug patents, tariffs on automobiles, and market access for dairy products remain among the “thorny issues” for negotiators. However, TPP opponents are quick to point out (pdf) that even if a deal is reached this week, Congress will not debate and vote on it until late winter because, as per the Fast Track legislation passed earlier this year, President Barack Obama cannot sign the deal without giving lawmakers 90 days’ notice. In a memo to reporters (pdf) circulated late last week, Public Citizen’s Lori Wallach called that scenario a political “nightmare”—at least for the corporate forces pushing the pro-corporate trade pact. Meanwhile, a poll released (pdf) Wednesday by the Coalition for Better Trade shows that a clear majority of voters who can offer an opinion about the proposed TPP say they oppose the deal. 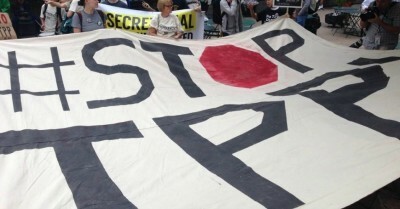 “Voters are opposed to TPP, and the Administration and Congress should listen to what they have to say,” said Khristyn Brimmeier, communications director for the group, which is made up of labor, environmental, and public health advocacy organizations.